years of tedious practice, or even natural ability. Slap Bass is the percussive funk bass style that first gained popularity with Larry Graham in the band Sly & the Family Stone in the late 1960's. Since that time the techniques have been modified and refined by many other bass greats including Louis Johnson, Bootsy Collins, Les Claypool, Flea, Stu Hamm, Mark King, Marcus Miller, Victor Wooten, Abraham Laboriel, Fieldy...and many more. Playing cool slap bass grooves is really just a combination of some special techniques and rhythm. But too often books and DVDs about playing slap bass assume you're already proficient at the syncopated rhythms used in Funk. They only focus on the techniques. If you're missing the rhythmic piece of the puzzle your slap bass lines WILL NOT GROOVE. 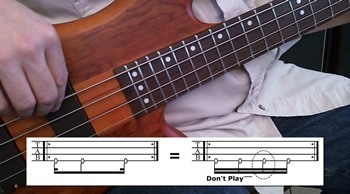 This is often why beginner and intermediate bass players who want to have fun playing slap bass give up in frustration. But have no fear. Learning the types of rhythms needed to play funky slap bass is not hard. You just need to learn a handful of simple "rhythmic words". Once you learn those words they can easily be combined together into sentences. ...And what better place is there to learn all about rhythms than while learning to play some fun slap bass grooves. This course is really a combination of learning the fundamentals of slap bass along with building your rhythmic vocabulary. Because the slap bass techniques don't work without the rhythms. So learning one without the other is a recipe for failure. Slap Bass Funky Fundamentals is broken down into 8 chapters. 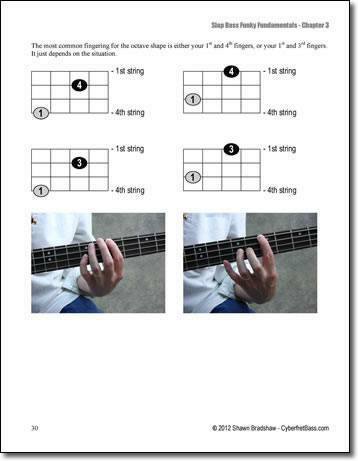 Each chapter includes video, detailed written instruction with tablature and jam tracks. The first chapter in this course will teach you "the slap", as well as get you familiar with some basics of music and rhythms that you will be building on in the next chapters. Even though the rhythms are simple at this stage, there are some great sounding jam tracks to make things fun. The next chapter is going to help you build your rhythmic vocabulary. 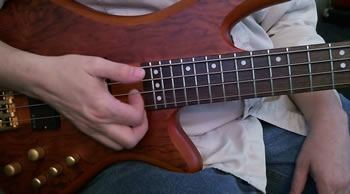 As well as introduce another essential slap bass techniques called ghost notes. 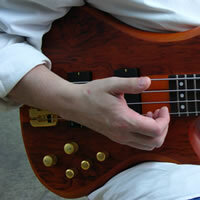 Learn all about rests and staccato to give your slap bass lines some needed "punch". The yang of the ying of slap style bass playing is what is called the pop. Learn the 2nd most essential slap bass technique called the "pop". In this chapter we are going to take a look at a couple of core bass techniques that will add a little extra spice to your grooves. 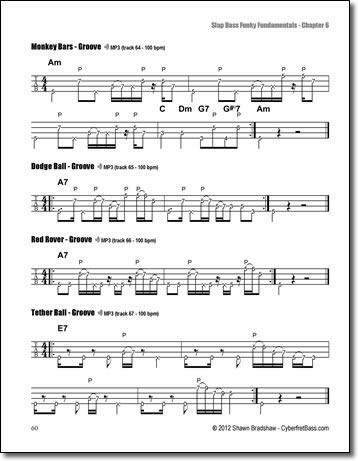 Learn a very important Slap Bass scale. 16th notes are the bread and butter rhythm of Funk. All of the previous chapters have built your vocabulary and understanding of rhythms to bring you to the most important rhythmic patterns for slap bass grooves. 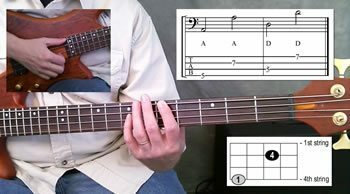 Learn how to build a slap bass groove with "The Funk Erector Set"
This chapter is all about just playing some fun slap bass grooves. The other chapters have focused on learning new techniques and rhythms, but this one is just about groovin'. This chapter introduces another percussive slap bass tool called "left hand hit ghost notes". In this chapter you will learn about 8th and 16th note triplets, as well as 12/8 time. Learn about "double cross" and "triple cross" hammer-ons. 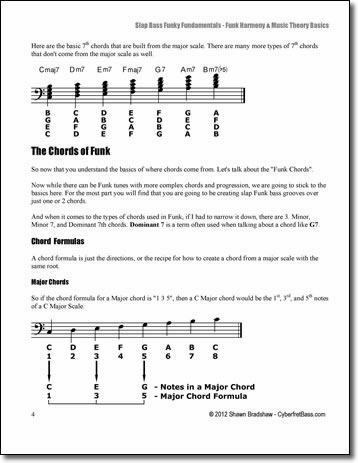 This bonus chapter will teach some of the basics of music theory that relate directly to Funk music. 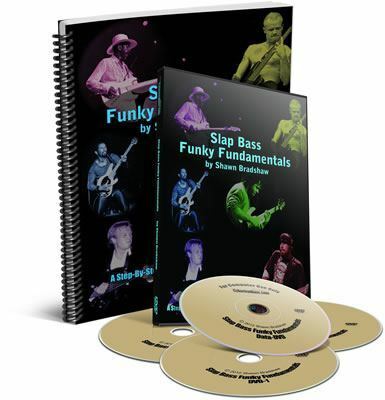 Things that will help give you some more insight into the grooves in the Slap Bass Funky Fundamentals course, and help you to better create your own grooves. At the core of this course are the videos. 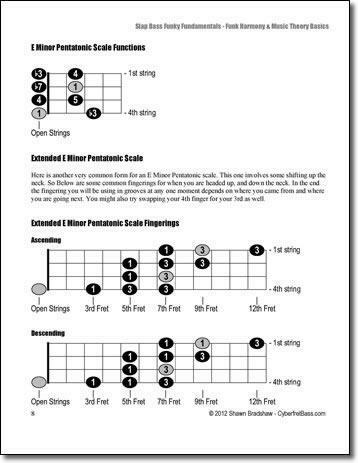 See detailed right and left hand views as well as on screen graphics and tablature. Having all of the tablature on screen will help you learn the grooves and moves faster and easier. No searching through the manual and looking in 2 places. 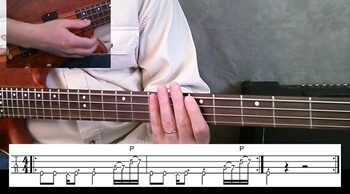 Here is a lesson for one of the grooves from Chapter 6 of the course. 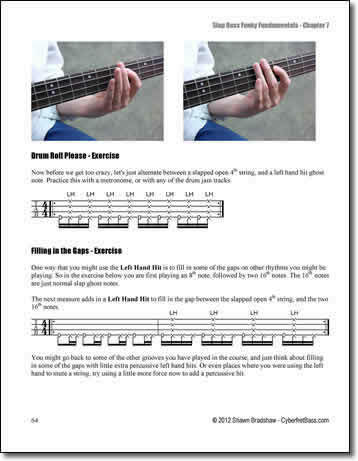 The 76 page manual for Slap Bass Funky Fundamentals not only has all of the tablature and diagrams, but also includes detail written instructions. There are Music Stand Printout PDFs for each chapter of the manual. These will let you printout just want you need for practice without the written instruction. This guide is not going to go crazy into music theory. Just some of the basics that relate directly to Funk music. 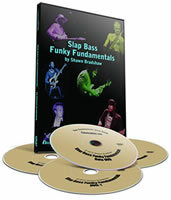 Things that will help give you some more insight into the grooves in the Slap Bass Funky Fundamentals course, and help you to better create your own grooves. The course includes 91 full band jam track to make practicing the slap bass grooves and exercises fun. Below are a few samples. As well as the full band jam track the course includes 142 drum jam tracks. The drum jam tracks are split into 9 different "Funky Drummers" with a full range of speeds for each drum style. Below are a few samples. The jam tracks are a lot of fun to play with, but sometimes you just need an old fashion metronome to work on your rhythms and timing. P.S. 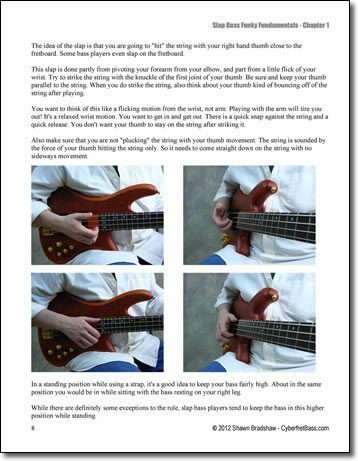 – Are you ready to end your slap bass confusion once and for all. 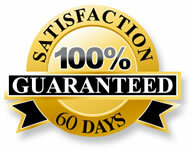 Try "Slap Bass Funky Fundamentals" Risk Free Today!